Discs. Circles. Roundels. Wheels. Planes with circumferences that are equidistant from their centers. I don't know that "buttons" would be the first word I'd choose to describe these. It seems to me the word "buttons" indicates something with just a little more depth or girth than just circular sheets of fruit snacky material. But it does say fruit leather—not fruit snacks or fruit chunks or fruit slabs—which would suggest something thin. I guess I was just hoping for something slightly thicker than paper thin. But they're that thin. They seem optimized not for eating but rather adhering to one's teeth like whitening strips—except in this case, they're oranging strips. Each button is just a little tease of flavor. I guess you could peel a bunch of them off at once and wad them all together for a single larger bite—something you could really sink your teeth into with a bigger blast of fruit taste. Fifty-nine cents seems like a great deal for a pack of eight fruit snacks, but there's very little actual food in there. Half an ounce net weight. You get what you pay for. And a good bit of what you're paying for is packaging. In addition to the cute outer wrapper, there are two long sheets of wax paper, one on either side of the discs. When it comes out of the pack, Sonia thinks it resembles... well, what do you think it resembles? I think it looks like a roll of Trader Joe's stickers—the kind they keep at the checkout counters at TJ's stores. Flavor-wise, they taste like natural fruit roll-up type deals. You can taste each of the constituent flavors. 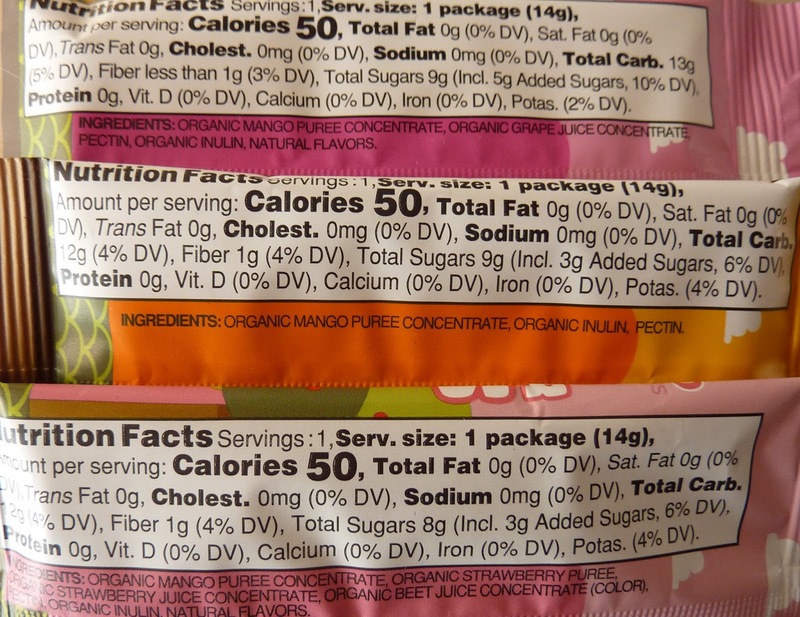 Mango, strawberry-mango, and grape-mango. Mango is my favorite in this case. It's the purity of the taste. There's no identity crisis like with the other two offerings. I think grape-mango works a little better than strawberry-mango, but that's just me. I think the mango overshadows the strawberry flavor a little bit, but the grape-mango has just enough red grape potency to hang in there. None of the flavors are unappealing at all. They're just kinda random. Trader Joe's is flirting with mango mania once again. I guess these would be pretty decent between-meal pick-me-ups or lunch box fillers, and they taste okay, too. But in the end, I'd rather just have those old fruit wraps we used to get all the time. Three stars a piece from Sonia and me on this one. I was surprised by how much I liked these, though you're right that you don't get much bang for your buck. It would make a nice decor for cakes. I had something similar and thought to my self, what is the point. Too much work to peel off the thin strip for the meager amount of snack you get. Just save the packaging and put one big blob in the package.